The key to a successful and healthy relationship is communication. Unfortunately, men and women don’t always communicate in the same ways. If a woman is unhappy in a relationship, she often wants to talk about those issues. If a man is unhappy, he may stay silent and start to pull away. If your boyfriend is starting to pull away from you, you shouldn’t panic. While your relationship may be having problems, these problems can be dealt with. Don’t assume that your partner is going to leave you; work to make your relationship stronger than ever. When your partner is pulling away from you, it is hard not to take it personally. It is important to remember that your partner isn’t pulling away because of you. This kind of behavior is both common and natural. Men don’t enjoy feeling vulnerable. When a person starts to fall in love with another person, they are more vulnerable than ever. In many cases, men aren’t pulling back because they don’t care about their partner. They become distant because they have strong feelings for their partner. You should know that these issues often aren’t about you and that they can be resolved. Don’t get upset or antagonize your partner. Stay strong and work to resolve these issues. Understanding why he is pulling away will help you to deal with the situation better and not get upset by it. Different people show love in different ways. You may show love with physical affection or with your words. However, your partner may prefer to show their feelings in a different way. You should respect that you and your partner are different people. If your partner isn’t giving you affection, you shouldn’t assume the worst. Instead, you should try to pay attention to the way they show their love. If your partner seems distant when you spend time together, you may want to provide him with some space. 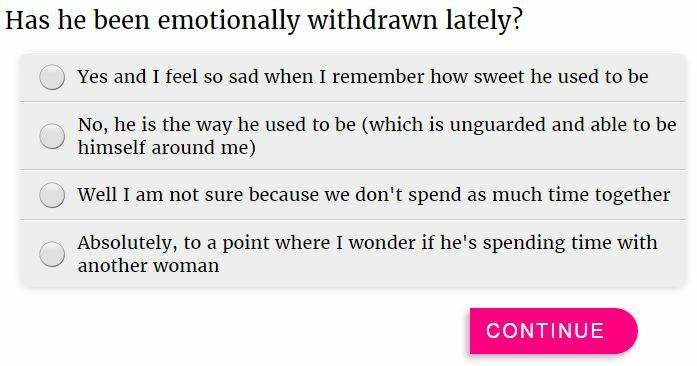 Men aren’t as intuitive as women are, and it isn’t always easy for them to sort out their feelings. If you spend all of your time around him, he may never figure out how he really feels. While you shouldn’t avoid your boyfriend entirely, you should make a point of giving him some space. Go out with your friends for a girl’s night. Wait to text him in the morning. From there, you can see how he responds. In some cases, the distance can create some much-needed tension in a relationship. When you aren’t around your boyfriend, he will realize how much he misses your presence. Once that happens, he will start asking you to spend more time with him. If your relationship was going well but has recently hit a slump, you should try to find ways to reconnect. Come up with a fun activity that the two of you can do together. You may want to go out to a nice new restaurant, or do something physical, like rock climbing. Think back to the activities you used to enjoy together, and do your best to recapture that magic. While you should communicate your feelings to your partner, you should refrain from expressing them on this date. Instead, you should simply enjoy your boyfriend’s company. When the two of you are feeling close again, you can start to talk through your issues. You may be feeling insecure because of the way your partner is behaving. It is important to remember that men can be insecure as well. Praise your partner and show them that you care. If your boyfriend does something nice for you, tell him how much you appreciate it. Compliment your boyfriend on his appearance when you see him in the morning. Warm your partner up. Make sure that he is confident in your feelings for him. If you want to bring up your issues with your partner, you shouldn’t make accusations. Doing this may make your boyfriend feel defensive, even if the two of you are on the same page. Instead, you should make the conversation around your feelings. Don’t say “we never talk anymore.” Say “I miss talking to you.” Don’t tell your boyfriend that he doesn’t seem interested in you. Tell him that you want your relationship to be passionate again. When you frame the conversation in this way, your boyfriend won’t feel like he is on the attack. Instead, he will focus on your concerns. Men tend to be problem-solvers, and many guys will relish the opportunity to resolve an issue. Together, the two of you should be able to fix those problems and build a better future for yourselves. If your boyfriend has become distant, you shouldn’t despair. This is a very common issue, and many couples have been able to work through it successfully. You should try to see this as an opportunity. If you and your boyfriend get through this, your relationship will be stronger than it ever was before. This article was provided by the American Dating Society. To read more of their articles, you can visit them here at http://www.asnamnat.org. OK, i will try to do these. hope your advice works for me and my boyfriend. i can’t bear just the thought of this ever happening to me. thanks for your posts, i’m sure a lot of women like me learn so much from you. this will definitely devastate me. but my boyfriend and i have very open communication, i would talk to him personally and ask what the problem really is so we can resolve issues he may have. i really don’t know what i would do..it would be devastating im sure. but, what can i do? i can’t force a guy to stay if he wants out. i think your insights are all true..it’s just really sad and being in that situation, im sure no one would know what to do for sure. this happened to me and didn’t know what to do. i just started to redirect my feelings toward my career and did yoga which helped a lot in my coping. i will try to praise him for good things he does. i have read from another book that it is very important for a man to be affirmed. @Sumayiyah so sad to hear. i think just give him space for now and then explain everything afterwards. make sure also not to entertain message form your ex if you really wanna be w/ this guy. i still don’t understand why sudden pulling away is normal for a man. they can just tell us how they feel, right? i always try to give him space when it feels like he’s exhausted. i also do my best in understanding him first instead of nagging him so we can have better communication. it helps a lot, it takes much effort from me though. these tips are great but i think this are all applicable within the relationship w/out the man pulling away. stories like this in real life make me really sad. i wouldn’t wanna go through the same heartache. Find ways to reconnect – sure thing! if you really want your relationship to work, make an effort as well. don’t be too focused on your emotions, try to analyze the situation and come up w/ a solution instead. this is a great post, i really need this right now.